Why should an online casino choose a weird and fancy name when the simple Casino.com can say it all. This web platform for online gamblers is ready to show players that they can have just as much fun as they would in any landbased casino. With a wide variety of different games, you can enjoy rewarding betting session without even leaving your home. 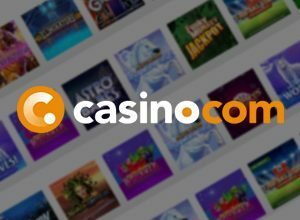 Casino.comPlay at Casino.com, get your £100 bonus now! Since the times have changed a lot in recent years, now you can bet in Casino.com no matter where you go. You can download an application of the casino on your mobile device which gives you the freedom to enjoy wonderful games anytime, anywhere. Although the games on this platform can be played instantly, you can also download the casino and play on your desktop. Of course, even if you play via your phone or tablet, you can be sure that the quality of the games will be impeccable. Providing a safe and at the same time entertaining environment for online gamblers is the number one priority of Casino.com. It is licensed and regulated by the UK Gambling Commission and the Gibraltar Gambling Commission. Customers can find any information they need on the website of the casino and if they have any questions they can always ask the highly competent Customer Support team. Whether you are a novice in the gambling field or you are an expert who is looking for new and more convenient ways to win money and play his or her favourite games, you are guaranteed to be fascinated by the variety that Casino.com offers. It would not be a true casino if there are no slot games. This is definitely one of the categories on the website which can reveal a long list of slots most of which were created by leading gaming developers such as NetEnt and Playtech. You are definitely guaranteed to enjoy a variety of colourful, fun and exciting slots, available on your computer and mobile devices. A few of the most popular slots are the Age of the Gods series, Elements: The Awakening, and Daring Dave and the Eye of Ra. The number of table games which players can enjoy at Casino.com is more than enough to make every online gambler experience wonderful betting adventures. You can find every variation of roulette as well as blackjack, baccarat, craps and poker. The abundance of table games is more than enough the fit the taste of each and every player who enjoys spending his/her time at Casino.com. For players who want to make their online gambling as real as possible, there are live-dealer games available for the customers of the web casino. Live Roulette, Live Blackjack and Live Hold’em are just a few options which players can enjoy in the comfort of their homes. Another great category packed with high-quality games is Video Poker. No matter which variation of video poker is your favourite, you will be able to play it at Casino.com. Jacks or Better, Deuces Wild, Aces and Faces and All American are a few of the casino’s video poker games. If you still are not satisfied with the variety of games which are offered on this web platform, there are still plenty of other options for online entertainment. If you open the list with Casual Games you will find different variations of games of luck. Innovative scratchcard editions, Bingo, Heads or Tails and Keno are just a few ways to test your chances of winning. There are definitely plenty of options for every type of online gambler and the fact that you can enjoy your favourite games even on your phone or tablet shows that Casino.com is always ready to provide the best online experience to its patrons. Having such a wide range of gaming adventures will help every customer to find their favourite game in no time. Playing at Casino.com is a wonderful opportunity for every roulette fan to enjoy a thrilling and rewarding experience in the comfort of their own home or wherever they use their phone or tablet. There are plenty of editions of classic European, French and American roulette but there are also quite a lot of variations which can make the entire adventure different and yet very entertaining. This variant of European roulette powered by Playtech is a wonderful game which players can enjoy whether they are rookies in this field or they have more serious experience with making advanced bets and enjoying big wins. Premium European Roulette is definitely easy to understand and the rules of the game do not differ from the ones that apply to European roulette played at landbased casinos. This is a typical single-zero roulette variant and players can benefit from a much lower house edge. If you are curious about your betting options, then you should know that in addition to the usual inside and outside bets, you can also make call bets such as Tiers, Voisins du Zero and Orphelins. The quality of the graphics of the game really proves the “Premium” feel of this variation of European roulette. With plenty of settings which allow customisation and easy-to-use interface, players are guaranteed to enjoy a betting experience which is just as thrilling as the one brick-and-mortar casinos offer. Premium European Roulette is definitely a great variation of the classic game and you can enjoy it if you become one of the customers of Casino.com. This variant of roulette is inspired by Greek Mythology and it is one of the progressive roulette editions at Casino.com. Players contribute to the constantly growing jackpot with a percentage of their bets but that gives them the opportunity to win the big prize while playing Playtech’s innovative edition of roulette. Although there is a single-zero, there is an additional purple socket on the wheel for the progressive jackpot and that increases the house edge to 5.26%. Although you are taking a higher risk while playing Age of the Gods Roulette, it is definitely worth playing the game. The characters, graphics and the overall gambling experience are like no other and if luck is on your side, you can even win the big jackpot. The table layout is standard and players can make inside and outside bets. There is also a racetrack which allows call bets which expert gamblers might find attractive. If you open the More Bets menu, you will see that Final bets are also an option that the game offers. Of course, you can also bet on the purple Age of the Gods pocket which is the equivalent of the double-zero of American roulette. This, however, should not discourage you because the gameplay of this edition of roulette is quite entertaining and you have the chance of winning a massive jackpot. When you love playing European roulette but you do not have the opportunity to visit a landbased casino, you can always try its virtual rendition. 3D Roulette is a game which will allow you to enjoy a gambling experience which is quite realistic and very entertaining. The animations and the design of the game are made to capture the attention of players and give them the chance to play this classic in their own homes. The table and wheel in the game are typical for the European version of roulette and you have a single-zero that makes the house edge only 2.70%. This gives players a better chance at winning. Players can make outside and inside bets which are nothing irregular for European roulette. There is also a racetrack that can help you make call bets such as Tier du Cylindre and Voisins du Zero. 3D Roulette can be played at Casino.com and that will allow you to enjoy a game with amazing graphics, user-friendly interface and expert betting options. All of that can ultimately make your experience more rewarding. Yet another edition of roulette with a progressive jackpot is Dragon Jackpot Roulette. This is a wonderful game which can provide an exciting and fun way to win some serious money. By activating the Dragon Jackpot, a percentage of your bet will contribute to the jackpot. You can also place a Dragon Bonus on up to 12 numbers on the table layout. Even though the design of the game is unusual, you still have the typical single-zero layout and wheel which are inherent to European roulette. You can place inside and outside bets and you can switch between the Betting Table and the Neighbour Table which will reveal a racetrack that can help you make call bets. The interface of the game is very easy to use and players can find all the information that they need in order to enjoy playing Dragon Jackpot Roulette. There is a zoomed-in window that shows where the ball has landed during the last spin of the wheel. You can also keep track of your game by following the History bar that displays your previous bets as well as your wins. This is a superb edition of European roulette and players who decide to try their chances with the Dragon Jackpot can win one of four jackpots. Casino.com is always trying to provide players with the safest and fastest ways to manage their online funds. This is why they accept a few of the most popular methods that can make your iGaming experience as secure and pleasant as possible. Patrons of the casino can make payments using VISA and MasterCard debit and credit cards, prepaid cards, e-wallets, Bitcoin, bank transfers, and instant banking. The currencies which are accepted by the online casino are EUR, GBP, USD, CAD, AUD, NZD, and CHF. If you are a Bronze, Silver or Gold player and you are using EUR or GBP as your currency, your limit for monthly withdrawals is €/£15,000. If you are utilising any of the other currencies, your limit is 22,500 in your currency of choice. If you want to withdraw your money in a currency, different than the ones mentioned earlier, you must withdraw the currency equivalent of $22,500. The time it takes for the transaction to be complete is between 1 and 3 days. The withdrawal limit for VIP and Elite players is €/£30,000 for EUR and GBP currency and $50,000 or the equivalent in other currencies accepted by the casino. Again, players can choose a currency, different than the ones which were listed above but the withdrawal must be the currency equivalent of $50,000. The time it takes to complete the transaction is 1-2 days. Since credit and debit cards have become a popular way of managing a person’s online transactions, Casino.com accepts both VISA and MasterCard debit and credit cards as a way to make a deposit to your virtual account or withdraw your funds. If you use Entropay which is a virtual prepaid card by VISA, you can make your online transactions by means of this method as well. The minimum deposit that players can make is $20 and the maximum is $25,000. Players who want to stay anonymous while playing online can use this way of managing their payments. Paysafecard is a great option if you want to make a deposit to your casino account without jeopardising your personal information. The minimum deposit that you can make with a prepaid card is $15 while the maximum is $300. E-wallets are another method which allows players to stay anonymous while doing online payments. Since Neteller and Skrill have become pretty popular among virtual gamblers, Casino.com accepts payments made via these e-wallets, as well. The minimum of the deposit that you can make is $15 and the maximum is $15,000. This electronic currency which has become very popular can now be used by players of Casino.com who want to make deposits without sharing any of their personal information. The minimum deposit that you can make using Bitcoin is $15 and the maximum is $500. Bank transfers have always been a safe method to transfer your funds from your bank account to your online account. This is why Casino.com customers can use this way to manage their payments. If you choose this payment method, however, you must know that it may take 1 to 2 days for your money to be transferred. Instant Banking is also a great way to make fast deposits to your online account as well as to withdraw your funds. The minimum deposit that players can make via a bank transfer is $25 while the one made via instant banking is $20. The maximum for both methods is $15,000. If you become an account holder and decide to explore the gaming options which are offered by Casino.com, you will be able to benefit from different promotions showing the casino’s gratitude towards its clients. For all real-money bets that you make while you are playing, you will be rewarded Loyalty Points. You can use them to buy cash bonuses. All those perks are a way of showing that Casino.com appreciates its customers. New Customer Offer. T&C’s Apply. 18+. SPINS: 20 ON REGISTRATION, 180 AFTER DEPOSIT, WINNINGS GIVEN AS BONUS FUNDS, 20X WAGERING. SPINS AND BONUS WAGERING ON AGE OF THE GODS GAMES ONLY. WELCOME BONUS: £20 MIN DEPOSIT, MAX BONUS £100, WAGERING 40X. GAME WEIGHTING APPLIES. BETTING LIMITS: SLOTS – £5 ALL OTHER GAMES – 10% OF BONUS AMOUNT. Bonus Betting limits: Slots – £5 All other games – 10% of bonus amount. This bonus is available only for new users of the casino. Players who create an account will receive 20 Bonus Spins on Age of the Gods slot games upon their registration. They do not need to make any deposit in order to use this reward. However, if players make a deposit of $20 or more, their deposit will be doubled up and they will receive another 180 Bonus Spins. The maximum Welcome bonus which you can receive if you are from the UK is £100 while the maximum for non-UK players is $400 and it expires 30 days after it has been credited to you. If you want to withdraw your Welcome Bonus you will also have to meet the wagering requirements before you make the withdrawal. You must wager your bonus 40 times before you can redeem it. After you have made a deposit you will receive 20 Bonus Spins immediately. The rest of the spins will be granted during the following 8 days during which you will receive 20 Bonus Spins per day. Your maximum winnings on the Bonus Spins will be transferred to your account as bonus money. You can withdraw them only after you meet the wagering requirements. You must wager your winnings 20 times exclusively on the Age of the Gods slots. To show you that weekends are the best time of the week, Casino.com picks a special slot every single week and gives players special rewards which apply exclusively to that game. 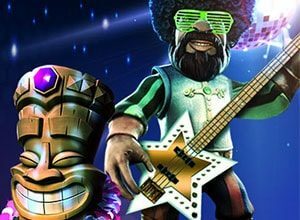 You can claim your Funky Friday bonus every week between 00:01 Friday and 23:59 Saturday (GMT). To withdraw your winnings you must wager them 40 times before you cash out. You can enjoy the perks of this promotion every Wednesday. Only players who have made their first deposit can take advantage of this bonus. Make a deposit of $25 or more and you will be able to choose between 50 Bonus Spins on Age of the Gods: God of Storms or 25 Super Spins on Jurassic Island. Winnings on these two games are credited as bonus money and they must be wagered 20 times before you can withdraw them. The wagering must be done exclusively on the game you have used your bonus spins. The maximum of the winnings is $1,000. You can claim this bonus every Wednesday between 00:01 and 23:59. This Bonus expires in 30 days if it is unused. This promotion starts at 00:01 (GMT) on the first day of every month and players have the opportunity to enjoy 100 Bonus Spins to top their first deposit of the month. The minimum deposit you can make is $100 which will allow you to claim your 100 Bonus Spins on White King. Each monthly promotion can be claimed between 00:01 (GMT) on the first day of the month and 23:59 (GMT) on the last day of the month. Your winnings from the bonus spins will be credited to your account as bonus money and you have to wager them 20 times on White King so that you can redeem them. If you do not use your bonus within 30 days, it will expire. Recommend Casino.com to your friends and you will receive a $50 bonus for each of your fellows who registers and makes a deposit at the casino. This bonus must be wagered 15 times before you can withdraw it. You should know that you will receive your bonus once the friend you have referred has wagered their Welcome Bonus 40 times. This bonus will expire after 30 days if there is no activity on the player’s online account.